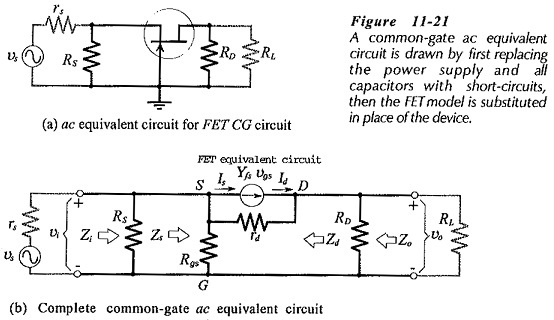 The FET Common Gate Circuit (CG) shown in Fig. 11-19 uses voltage divider bias. The ac output is taken from the drain terminal, and an external load (RL) is capacitor-coupled to the drain, exactly as in the case of a common-source circuit. Unlike a CS circuit, the ac input for the CG circuit is applied to the FET source terminal (via C3), and a capacitor (C1) is included to ac short-circuit the gate to ground. Because the gate is grounded, all of the ac input voltage appears across the gate-source terminals. As in the case of other circuits, the supply voltage and capacitors in Fig. 11-19 are replaced with short-circuits in order to study the circuit ac performance. This gives the common-gate ac equivalent circuit in Fig. 11-21(a). The input terminals of the ac equivalent circuit are seen to be the PET source and gate, and the output terminals are the drain and gate. The gate terminal is common to both input and output, so the circuit is named common-gate. The completer CG ac equivalent circuit is drawn by substituting the FET model into the ac equivalent circuit, [Fig. 11-21(b)]. As always, the indicated current directions and voltage polarities are those that are produced by a positive-going signal voltage. Looking into the source and gate terminals of the CG circuit in Fig. 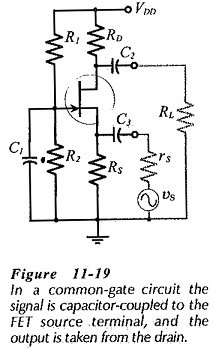 11-21(b), is similar to ‘looking into’ the output of a common-drain circuit. Therefore, the equation for the Common Gate Circuit device input impedance (Zs) is derived in the same way as, the equation for Zs in the common-drain circuit. The circuit input impedance is Rs in parallel with the device input impedance. 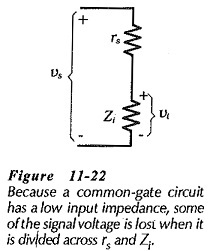 Using a typical Yfs of 5000 μS, the input impedance of a Common Gate Circuit is around 200 Ω. Low input impedance is the major disadvantage of the Common Gate Circuit, because the signal voltage is divided across rs and Zs, (see Fig. 11-22). Equation 11-20 is similar to Eq. 11-7 for the voltage gain of a common-source circuit, with the exception that there is no minus sign in Eq. 11-20. So, the voltage gain for a Common Gate Circuit is the same as the voltage gain for a common-source circuit with the same component values. As, already discussed, there is no phase shift between the input and output of a Common Gate Circuit, hence the absence of the minus sign in Eq. 11-20. When Rgs ≫ RG (which is usually the case), Eq. 11-21 gives Zi = 1/Yfs, and Eq 11-22 gives Av= Yfs(RD||RL), which are the equations for a CG circuit with the gate bypassed to ground The Zi and Av effects occur only in situations where very high value bias resistors are used in a CG circuit. 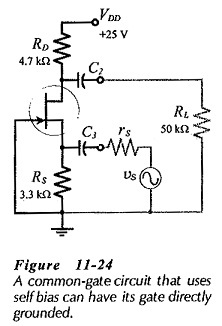 Figure 11-24 shows a CG circuit that uses self bias. 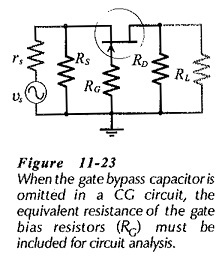 In this case, RG is omitted because there is no signal applied at the gate input; the gate is directly grounded and no gate bypass capacitor is required. A Common Gate Circuit has a voltage gain, no phase shift between input and output, low input impedance, and relatively high output impedance.